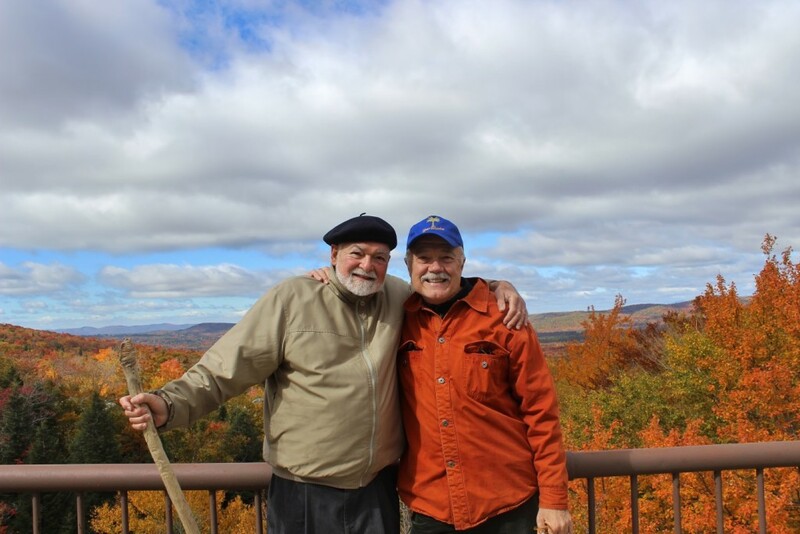 Yes folks The Two Happy Husbands went gallivanting around the North Country again! Leo insisted that we make plans for a fall foliage road trip this year and who’s gonna argue with that idea – not me. 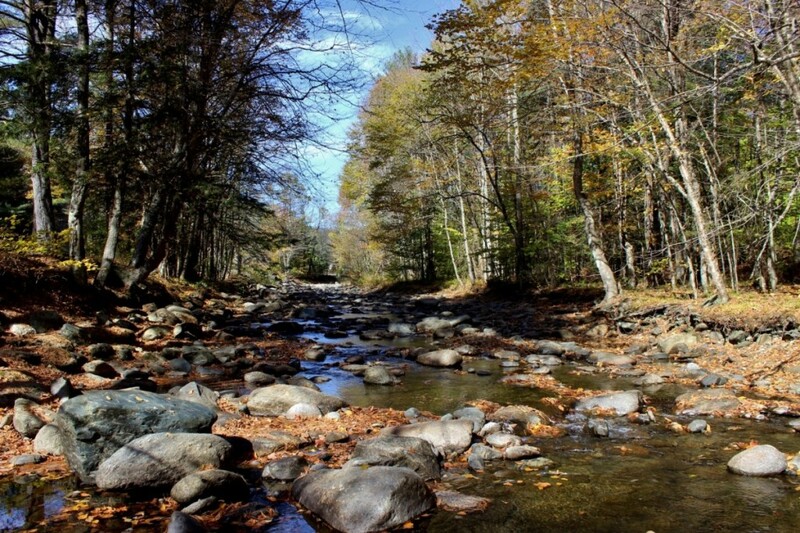 So off we trundled on Oct 8th for a week long trek to some of our favorite New England places. The hot and dry summer delayed the foliage this year and when we arrived at Lincoln New Hampshire, nestled in the White Mountains near Franconia Notch, we were in the midst of spectacular autumnal glory! When the light shines through the glowering clouds and ignites the yellow / orange maple leaves, the sight is truly breath taking. Here the vibrating contrasts between deep blue and orange explode like a trumpet fanfare proclaiming the divinity of nature. 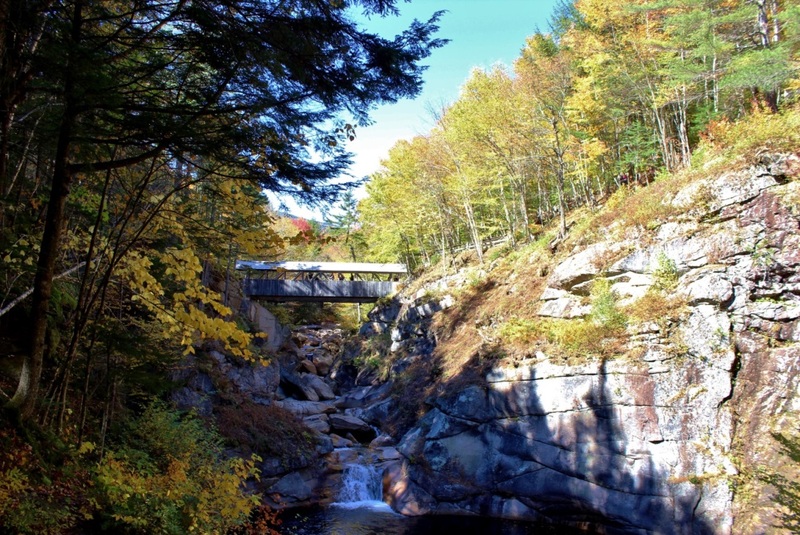 This is a picturesque view of the “Sentinel Bridge,” a quaint covered bridge spanning a deep rock gorge cut by The Pemigewasset River at the end of the Ice Age, 14,000 years ago. 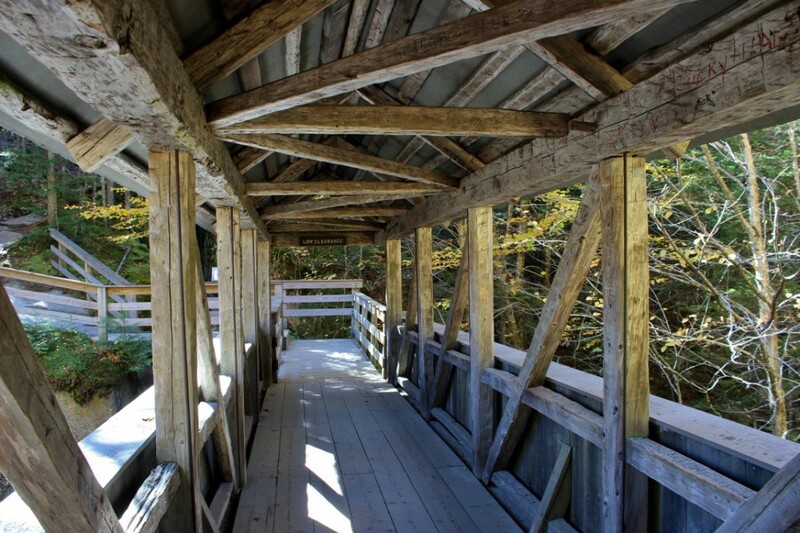 This wooden pedestrian bridge was constructed in 1939 on top of an immense pine tree that was blown over in the hurricane of 1938 making a natural bridge high over the turbulent mountain stream below. This venerable sentinel pine tree stood 175 feet high, with a circumference of 16 feet. The hand-hewn bridge surmounting the “Sentinel” is a feature of the Flume Gorge New Hampshire State Park where a well maintained system of trails meanders through a beautiful forest where views of the surrounding mountains are glimpsed through breaks in the trees. 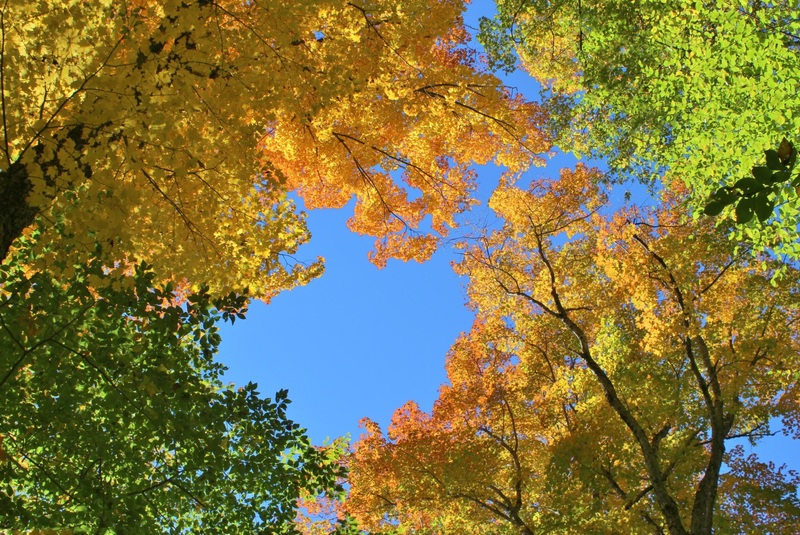 A canopy of color, like hallows of fire, frame a limitless blue sky. 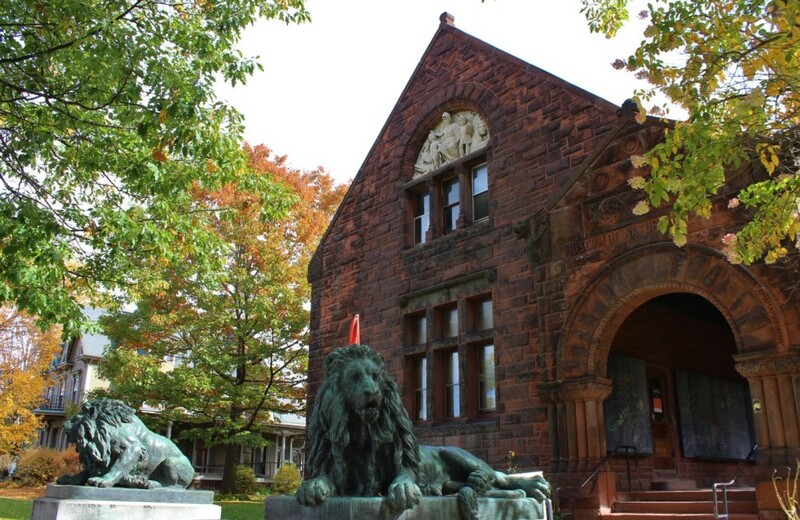 Passing through Franconia Notch we motor on to St. Johnsbury Vermont where we paid a call on the verdigris bronze lions guarding the Fairbanks Natural Science Museum. The brownstone building (1890) designed in a “Richardsonian” Romanesque style is a favorite of mine and we went in to visit with the host of animals enlivening the exhibit halls. 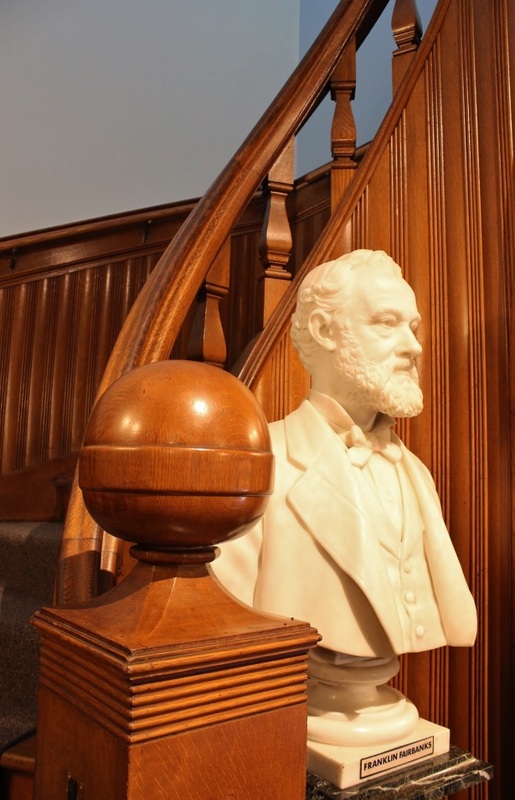 Here is a handsome portrait bust of the founder of the museum, Franklin Fairbanks, whose family invented and manufactured Fairbanks balanced scales and other precision instruments, making the town of St. Johnsbury prosperous and world famous. Franklin’s passion was for natural history. He collected mineral and animal specimens beginning in childhood and then throughout his life, resulting in the fruition of his ambition to build a museum for his ever expanding collections. The impressive barrel vaulted ceiling of solid oak runs the entire length of the building making a grand exhibition hall where a wealth of exhibits represent the fauna and flora of our world. 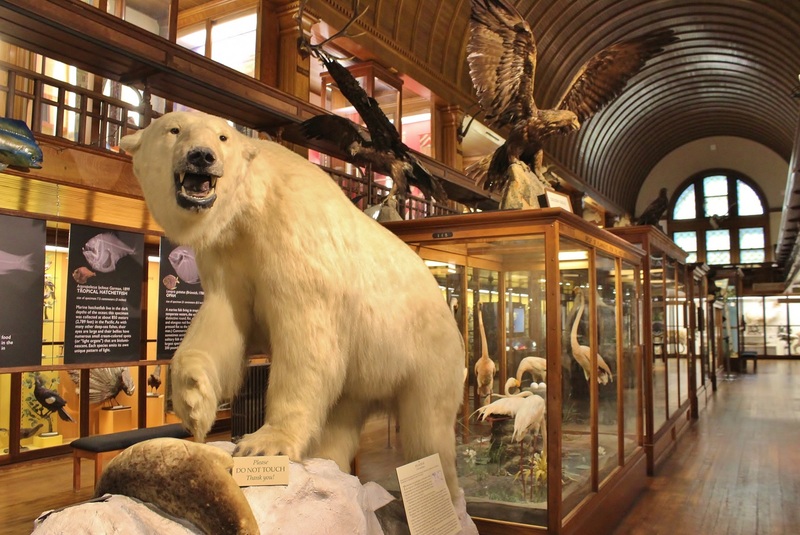 In recent years all the exhibits have been refurbished and reinstalled but retaining the original cases and museum fixtures creating a fascinating institution with a handsome “Victorian” atmosphere. 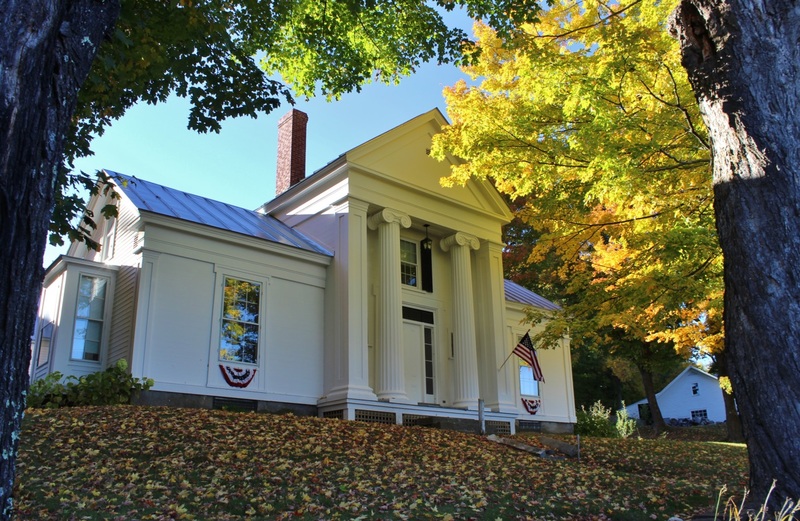 Here is the ever delightful St. Johnsbury Athenaeum, a library / art gallery conceived, created and funded by Governor Horace Fairbanks. 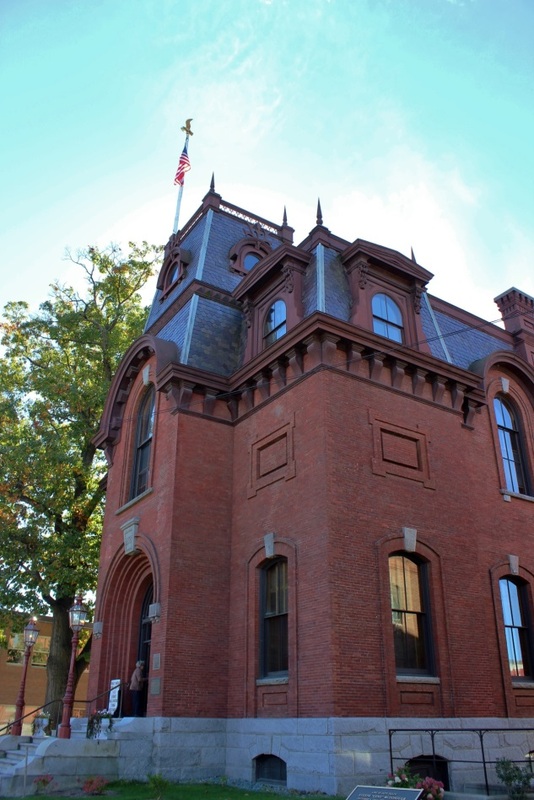 The Governor was another member of the civic minded Fairbanks family who also created the Natural History Museum across the street in St. Johnsbury. The Athenaeum was designed by John Davis Hatch of New York and built by Lambert Packard of St. Johnsbury in 1871. It is in the Second Empire French style often called Mansard after the famous seventeenth century French architect, Francois Mansard who utilized the distinctive roof shape of steeply pitched sides. Here is the impressive front reception hall of the St. Johnsbury Athenaeum all fitted out in golden oak woodwork with warm soft tones painted on the walls. All the fixtures and furnishings are original and designed for the library. The art collection was assembled specifically for the institution and some of the paintings and sculptures were commissioned by Governor Fairbanks and members of his family from living artists of their time or are reproductions of famous paintings of the past. 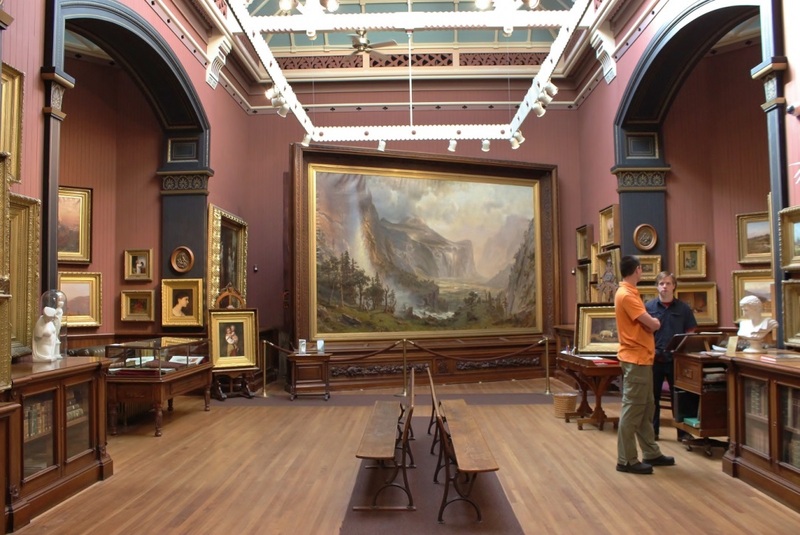 The collection concentrates on United States landscape painting with many “Hudson River School” paintings of the mid Nineteenth century. The noble intent of the Athenaeum was to share with and educate the public on an academic, artistic and spiritual level. 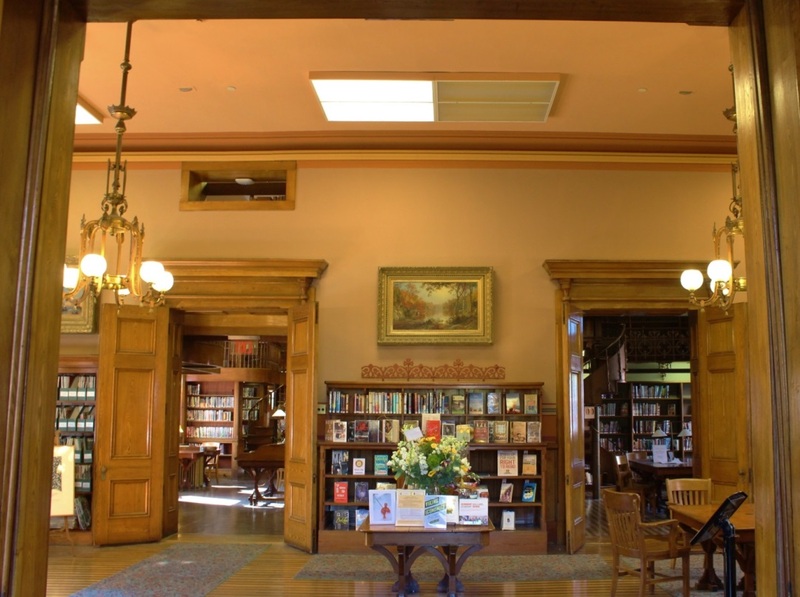 All over our country successful citizens and communities have created and endowed cultural, medical and educational institutions that greatly benefit common folk, especially public libraries. These are the kind of generous and cordial sensibilities that form the backbone of our national character which is an extension of the idea that good business is cooperation and the intent of democracy is prosperity of the mind, body and spirit for all our extended family. The observable fact of nature is abundance, from grains of sand on the beach to infinite stars scattered in space. If we stay in balance with nature we can live in harmony with the universe and each other. This wise attitude is the well spring of a grateful and generous spirit. In 1873 an art gallery was added to the Athenaeum. The interior architectural trim and floor are made from black walnut and the walls are painted with a mauve shade that sets off the gold frames of the paintings. The Focus of the collection is Albert Bierstadt’s 1867 painting, “The Domes of Yosemite” a 10 X 15 foot panorama that is as thrilling a sight now as when Governor Fairbanks acquired it in 1872 a few years after Yosemite Grant was declared a national park. 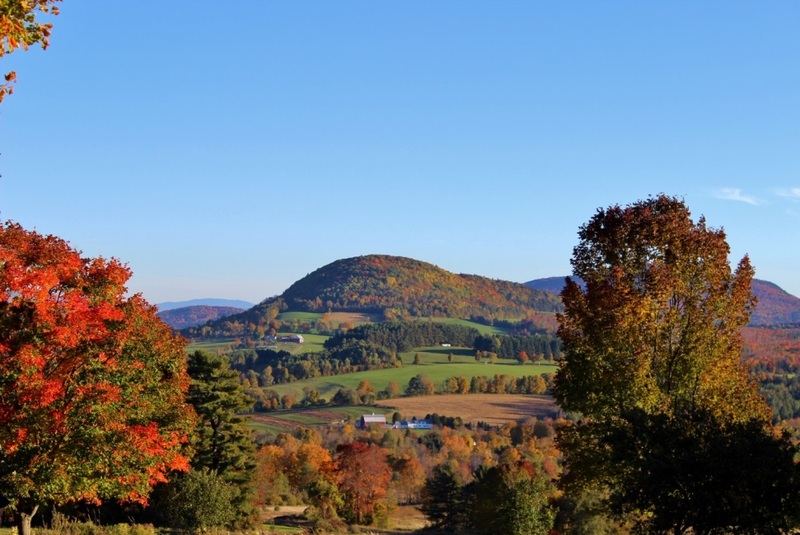 This is a quintessential view of the Vermont country side with its open fields and forested mountains as seen from the heights of the Peacham town cemetery. The village of Peacham is dotted with fine old homes proudly maintained and lovingly cared for. The hills are alive with the sound of music on a mountainside in Stowe Vermont where the Von Trapps sought refuge from the turmoil of war-torn Europe in 1942. 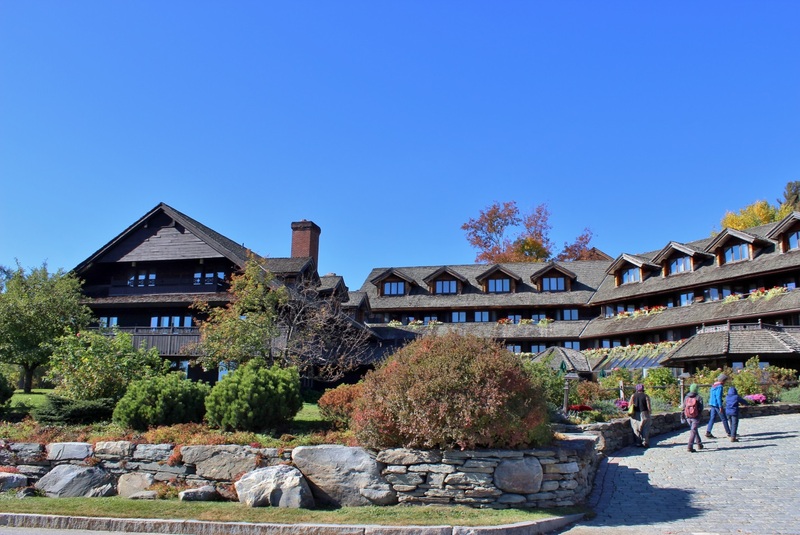 From this absolutely divine spot the Von Trapp family toured the United States singing for their supper and gathering enough sustenance to return to their beloved farm, “Cor Unum” or (One Heart). 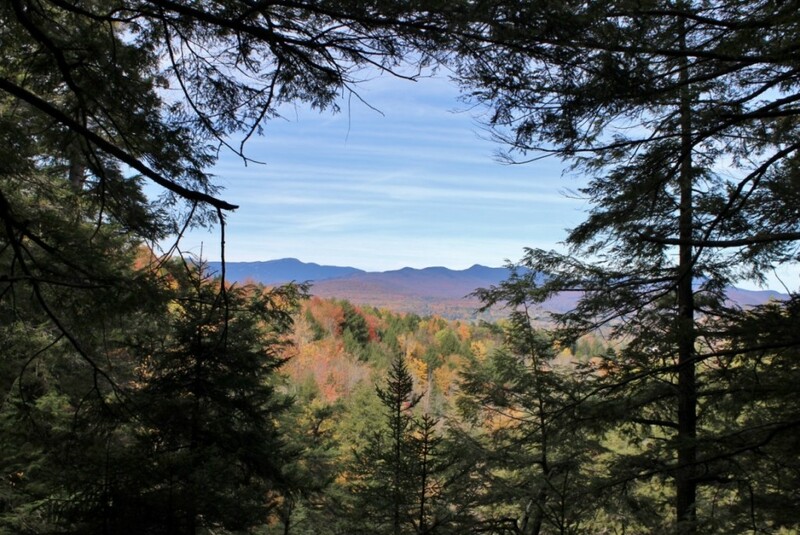 This view of an entire mountain range shimmering with autumn gold is what you see when visiting The Von Trapp Lodge. The family have worked hard over the decades and created a first class country hotel, cross country ski resort, brewery etc. 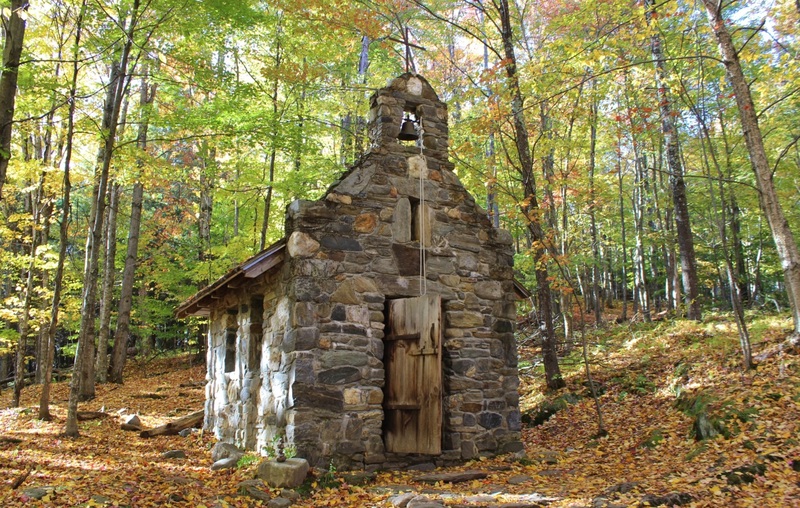 The Stone Chapel was built in the forest above The Trapp Family lodge to honor WWII soldiers. There is no glass in the windows, the chapel is open to the elements and simply constructed of native Vermont field stones. The sturdy oak door has no lock and the bell rings a cheery tone of peace. 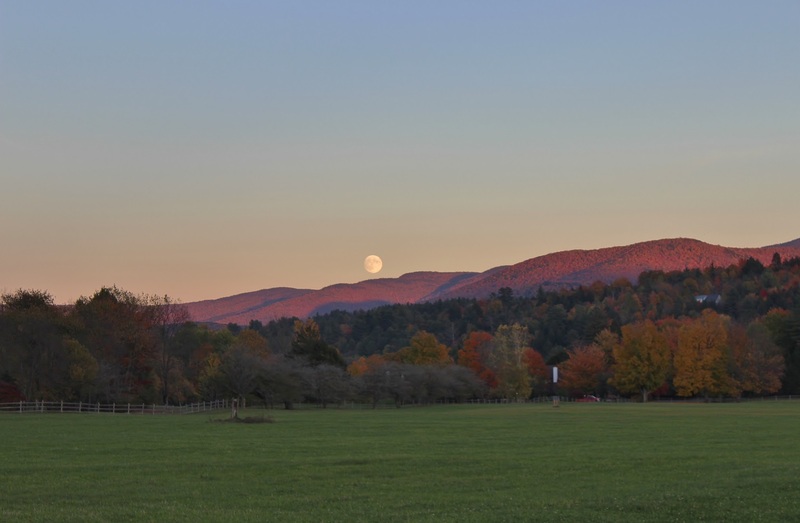 The purity of the harvest moon rising over the mountain ridge at Stowe Vermont contrasts against the soft mantle of maple leaf tapestry rolling over the ancient mountains. 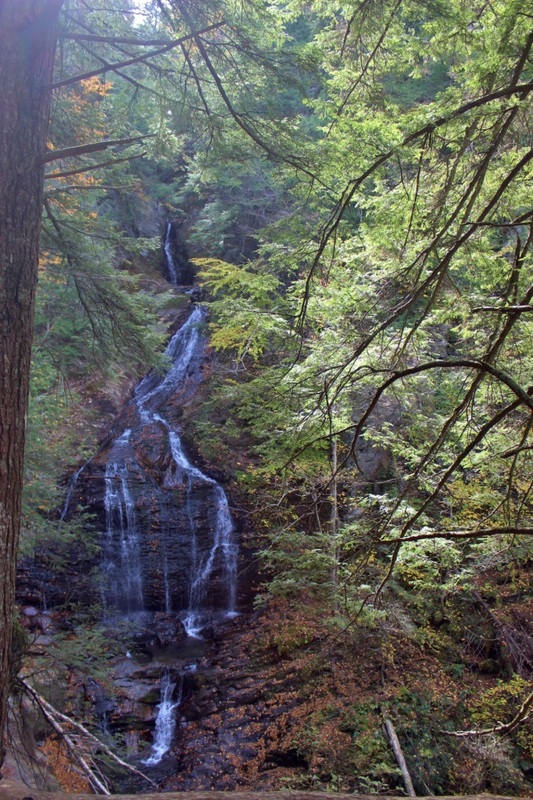 In a secluded wrinkle of the Stowe country side Moss Glenn Falls fills the chilly forest with a fine mist. 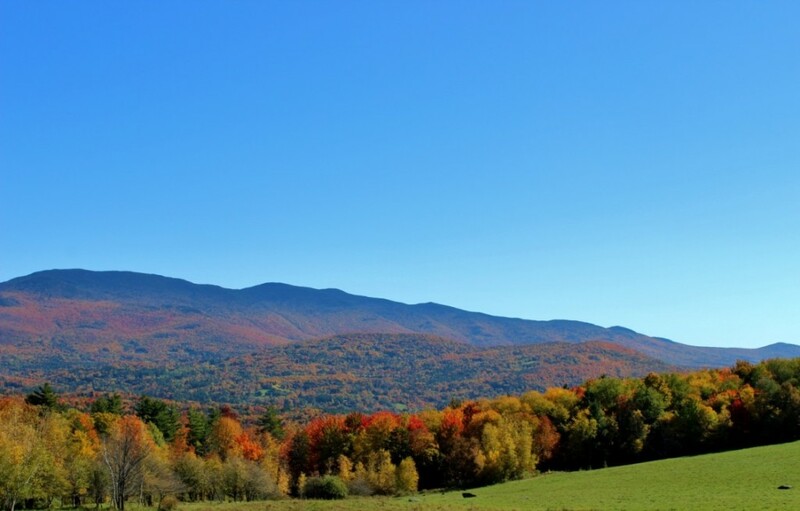 Leo and I consider the views from the Stowe mountain road to be the most perfect in Vermont. We could not pass up a visit to Shady Rill, the gently flowing mountain stream that has presented us with a spectacular array of stones for our garden over the years. 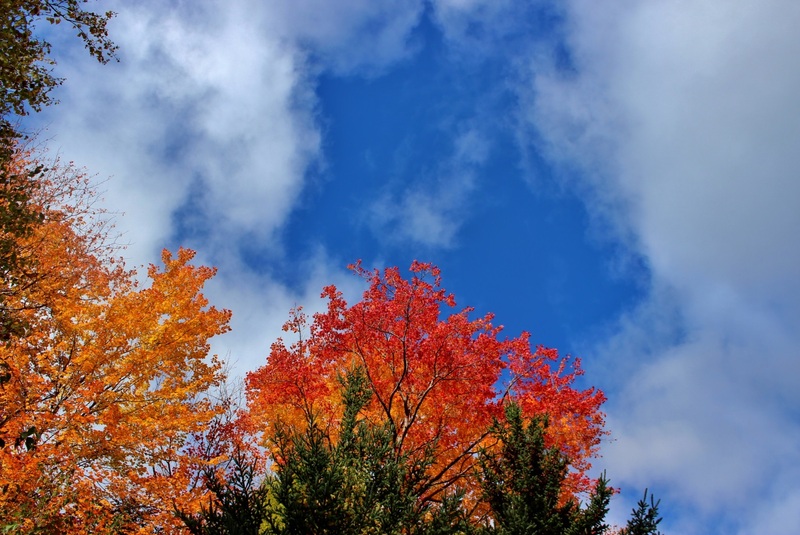 This entry was posted in Autumn in New Hampshire VT on November 15, 2016 by ioryallison3.